The artwork is extremely well done, and while the cartoony look doesn’t necessarily capture the seriousness and sacrifice of the invasion, it does well to keep the infographic clean and clear. There is a lot of information and, considering the amount of statistics, it’s quite easy to read. There is enough presented here to give a person a solid overview of D-Day’s perspective – at least from the Allies point of view. 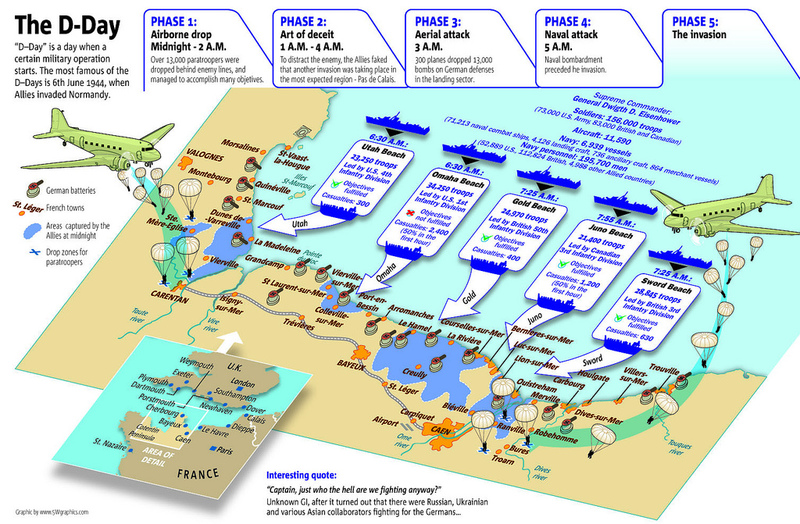 Of course, there is a lot of interesting detail about D-Day that isn’t in this infographic, but a solid amount is packed in here nonetheless. A little bit more proofreading. Phase 1 “…managed to accomplish many objetives.” “Supreme Commander Dwigth D. Eisenhower”. Also, the naval vessel figures don’t quite add up. Bit of a shame considering how well done it is otherwise. The visual ideas were good, and there is a lot of info, but the mistakes cut from the credibility. I found this infographic on this Flickr page, and while it’s credited to the talented folks at 5W Infographics, I can’t seem to find it in their site portfolio. This entry was posted on May 20, 2010, 9:00 am and is filed under History. You can follow any responses to this entry through RSS 2.0. You can leave a response, or trackback from your own site. Infographic will ease people in understanding something. It can be used for making plan. Making schedule can be also done with it. The smaller map that’s supposed to show how the larger map fits in France misidentifies the Brittany Peninsula as the Contentin Peninsula and thus misplaces the whole invasion. Even a quick visual scan of the two maps shows that they don’t line up together. 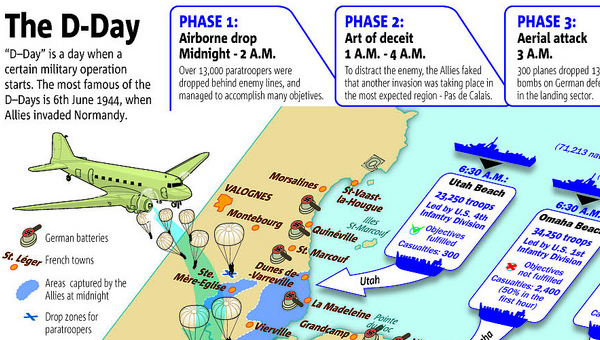 How do you make a map of the invasion of Normandy and then not get the location of Normandy right?